McCain, Rudy would win Pa.
Sens. 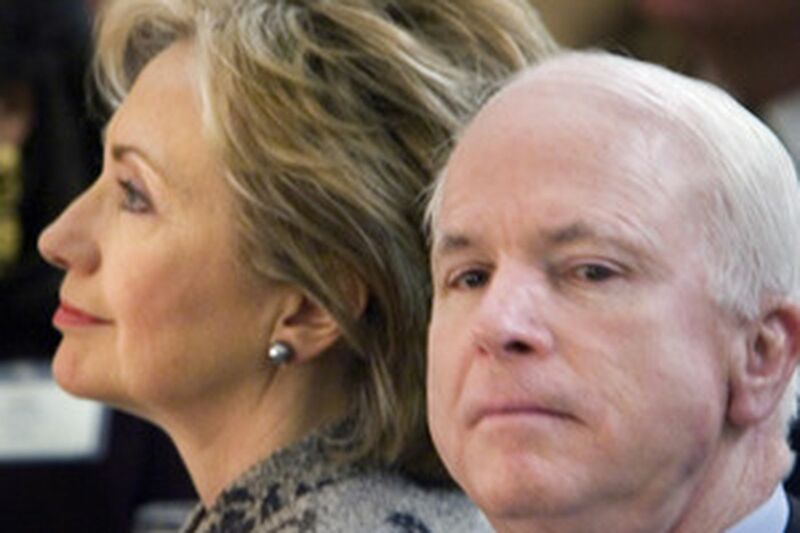 Hillary Rodham Clinton and John McCain at the National Prayer Breakfast earlier this month. A Daily News/Keystone poll shows that McCain would defeat Clinton in Pennsylvania. LOOK OUT, Hillary! Watch your step, Barack! If the 2008 presidential election were held today, Republicans John McCain or Rudy Giuliani would beat Democratic front-runners Hillary Clinton or Barack Obama, according to the latest Daily News/Keystone Poll. No Republican presidential candidate has won Pennsylvania since George H.W. Bush beat Michael Dukakis in 1988. In the presidential showdown, Sen. McCain beat Sen. Clinton 45 percent to 41 percent and beat Sen. Obama 43 percent to 37 percent. Former New York City mayor Giuliani proved even more popular. He beat Clinton 53 to 37 percent and beat Obama 52 percent to 32 percent. Terry Madonna, director of the Center for Opinion Research at Franklin & Marshall College, which conducted the poll, said that McCain and Giuliani benefitted by being viewed as moderate Republicans. "Both of these guys are not party regulars; they're not identified in the same way with the Republican party," he said. It's a good thing they aren't viewed as the same kind of Republican as the current president, George W. Bush, whose popularity in Pennsylvania is at an all-time low. Madonna also noted that while Pennsylvania has gone Democratic in the last four presidential elections, it has been mostly by small margins. "It's trended Democrat, but it's still marginal enough that [Pennsylvania] is going to be a major player," he said. Clinton may be fighting an upward battle here. The poll showed that 46 percent of registered voters gave her a "not favorable" rating. Only 32 percent viewed her favorably, while 17 percent were undecided and 5 percent didn't know. "In Hillary's case she has high negatives for two reasons: one, the belief by many that she's polarizing, and the second one is the war," said Madonna, referring to Clinton's refusal to admit a mistake in voting to authorize military action in Iraq. Obama might have room to grow, according to the results. His ratings were 31 percent favorable, 15 percent unfavorable and 20 percent undecided. But the highest percentage - 34 percent - said they don't know enough about him, which suggests he could still impress voters. "Obama, the people who know him like him," Madonna said. "His problem is he's got to become better known. He's still kind of a media creation." There are also the gender and race factors. Clinton would be the first woman, and Obama the first African-American, elected president. Could that be motivating Pennsylvania's voters to go Republican? Madonna said he didn't think that was the main reason, saying he thought Clinton's negatives and Obama's lack of name recognition were bigger issues. "If you're going to ask me if I think there's some residual problems with electing a women or an African-American, yes," he said. "Do I think they can overcome it? Yes." Women voters favored Clinton over McCain, but were evenly split between McCain and Obama. But female voters chose Giuliani over both Clinton and Obama. African-American and Latino voters vastly preferred Clinton and Obama to McCain and Giuliani. Bush's approval ratings, meanwhile, continued to plummet, hitting a new low in this poll. Only 5 percent of registered voters said he was doing an excellent job; 22 percent called it a good job, 27 percent a fair job and 46 percent called his effort a poor job. Gov. Rendell's ratings remained stable, with 50 percent saying he was doing an excellent or good job, 34 percent a fair job, and 14 percent a poor job. Responses were mixed on Rendell's recent budget proposals, many of which involved raising taxes. The most popular was a proposal to provide uninsured Pennsylvanians with health insurance coverage by taxing businesses that don't offer coverage and increasing taxes on tobacco products. Forty percent strongly favored and 27 percent somewhat favored that idea. Least popular was a proposal to lease the Pennsylvania Turnpike to generate money to repair state roads and bridges. On that plan, 28 percent strongly opposed it and 16 percent were somewhat opposed. Residents remained moderate on controversial issues like abortion and gun control. On abortion, 20 percent said it should be legal under any circumstances, 53 percent said legal under some circumstances and 26 percent said it should be illegal. On gun control, 39 percent said they strongly favored more laws that regulate gun ownership. Another 17 percent said they somewhat favored such laws, 15 percent were somewhat opposed, and 26 percent were strongly opposed.